I think I'll put everything in a canvas bag to give it good exposure. Dean, I use screw top medicine bottles and would be interested in seeing how it fares. Dave, I have a few of them I am planning on using. A few 35mm film cans and what ever I can find. Think I'll hang an ammo can in the tree too. I have a few matches to play with and it's a big tree. Dip some in different waxes and coatings. The typical plastic military match case. Oooh, and have some just in a regular Ziplock bag. You should throw in a lifeboat match or two for comparision. Can do. Coated some tonight. Need to start rounding up some containers. Thought I would get a medicine container and put one drop of water in it to see want effect it has. I think it will be like Geocaching. There's a lot of good cache containers out there but some people just don't take the time to close them right or just don't care and they get wet. Medicine container - yes! Very cool experiment! I love this kind of thing. I don't know if it would go along with your experiment, but leave a regular lighter outside all winter. Does it end up better than some matches? Can it still light? Etc. Just food for thought. 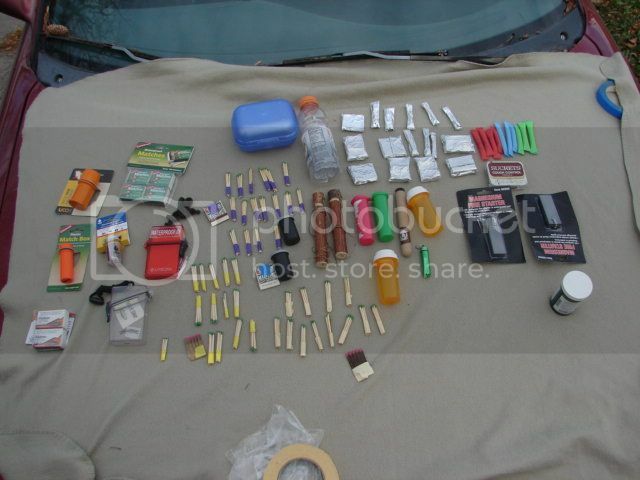 I was thinking of a few lighters maybe a fero rod or two. Hate to lose a Zipo, but might find an old one. Maybe a few Flint lighters vs piezo. Was looking for a few soap holder containers but couldn't find any yet. I've made a few kits out of them. Lot more room than a Altiods tin. Was thinking of having an exposed bag and one in a milk jug with the bottom cut out. Was on Facebook and someone wanted some life boat matches left outside and some lite every few days. So I thought I would do another experiment also. Do different coatings and leave them outside and light a few each day for a month. I have the matches. So far I have paraffin, bees wax, turpentine, nail polish, NewSkin, Hurricane, untreated. Anything else anybody wants? I have a few kits from other people and most of them use pill bottles for match containers. Might have to do a few different things with them. Miniature one shot liqueur plastic bottles might work for containers. Have a few more containers to get. But I have paraffin, bee's wax, turpentine, boiled linseed, nail polish some just wrapped in tin foil matches. Some of the containers are candy, film, homemade elderberry case, cigar case, I'm going to make a waxed leather case and some out of shotgun shells. Have some sealed in straws. I suggest putting a small bag silica gel dehumidifier crystals in with the matches. would be interesting to see if it would make a difference. In camera equipment they usually include a little cloth bag of silica crystals. Keeps the vapor off the lenses I believe. Current time: 04-26-2019, 12:23 AM Powered By MyBB, © 2002-2019 MyBB Group.